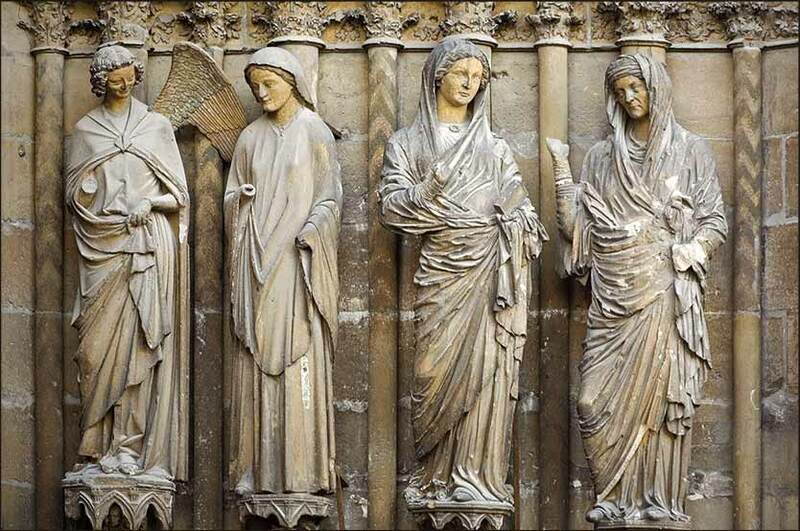 A carving on Reims Cathedral (@ 14th Cent.) showing the visitation of Mary and Elizabeth. Notice that the plinths descend in height, beginning with Gabriel, and that he and Mary have purer looking garments than Elizabeth and her mother. May Luciano Pavarotti's soul be blessed. He truly gave us a foretaste of the voices of angels. Walk with me, dear Lord, so that I may not be alone as I face this day, but always in your presence. Your joy is a lighthouse in a world often dark with sin, and I pray that I may inspire others as I have been inspired. In the name of Christ, bless me this day, and all whom I may meet. And Elizabeth was filled with the Holy Spirit, and she exclaimed with a loud cry, "Blessed are you among women, and blessed is the fruit of your womb! And why is this granted to me that the mother of my Lord should come to me? For behold, when the sound of your greeting came to my ears, the baby in my womb leaped for joy. And blessed is she who believed that there would be a fulfillment of what was spoken to her from the Lord." The Scripture from today and yesterday forms the basis of the text for the Ave Maria. Although this is known primarily as a Catholic prayer or hymn, I have heard it sung in Methodist and Baptist churches, so I surmise that it is appreciated in most denominations. Elizabeth is Mary's cousin, and the two have good reason to be friends. Both of them have become pregnant by a miracle announced by Gabriel, an angel of God; in Elizabeth's case, she was unable to have children, and in Mary's case, she has not slept with a man. Moreover, their children's lives will be linked together in the most profound moment of human history. Elizabeth's child, John the Baptist, will be a great prophet in his time and will become the man who announces the imminent arrival of Christ, and then baptizes Him. 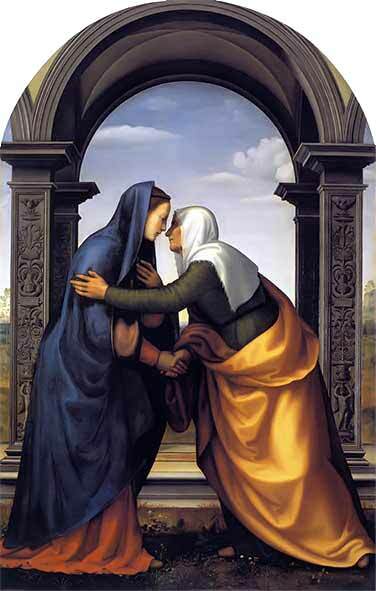 The Visitation, Mariotto Albertinelli c. 1503.